I must admit, I set out thinking more about the shapes and colours of this pickled vegetable dish before the flavours, as I couldn’t resist the red of radish against the bright green of cress leaves. Strong, vivid colours will always make a dish look more appetising – which must appeal to our natural instincts for healthy food – and pickling is a great way to intensify those colours. Pickling also creates a sharp contrast of flavours to freshen the palate, and everything here was so sharp, sweet, crunchy and fresh that I was hard pressed not to eat it straight from the bowl. This dish would work well with lightly-spiced chicken, steamed sea bream and lemongrass, or perhaps scallops quickly sautéed in butter and orange zest. Mix together the sugar and liquid ingredients in a bowl and stir well until the sugar has dissolved. Add the remaining ingredients, apart from the cress, and stir gently, making sure they are covered by the vinegar. Set aside and leave to pickle for half an hour or so. Scatter over the cress and serve as a side dish or pile delicately on the plate with your chicken or fish. If serving in the bowl as a side dish, just make sure everything can be seen. The white inner circles of the radish make great ‘frames’ for the cress and mushrooms. Try and fold the cucumber in nice waves throughout. If serving directly on the plate, it’s nice to space all of the elements out and create a graphic pattern on the plate to then place the other elements in and around. Use the pink sugary vinegar left in the bowl to create vivid spots and drizzles on the plate. Beautiful – where can I find the salsa verde recipie? Thanks Isla, I’ll be posting that one very soon. I just love the photo! Such intensity of colour…wonderful stuff. 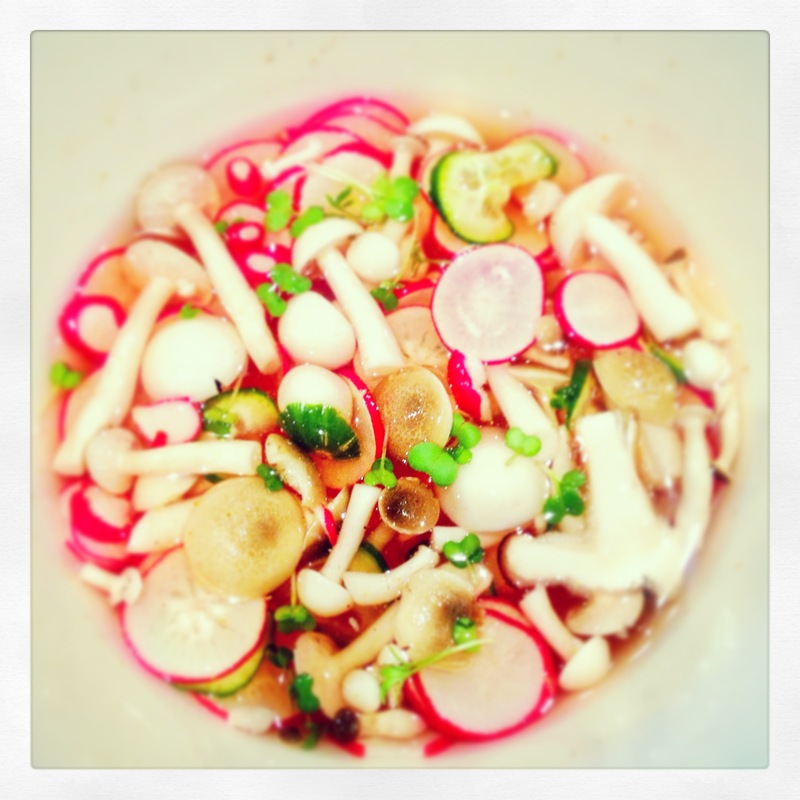 I tried a recipe for pickled radishes recently – it was a revelation.